I love salads and one accompanies most dinners that I prepare. I love to enjoy my salad after the main course as I find it to be a lovely finish to the meal. My everyday dressing is simple and fast but I have to admit that making other variations are pretty simple too and they only call for a few extra ingredients. Having some good dressing recipes in your repertoire is a great thing, in my opinion, as they can be used for all kinds of salads: lettuce, pasta, veggie, bean…the possibilities are endless! Here is a vinaigrette recipe that is of a slightly more creamy variety – it's inspired by one that my Mom would often make. While I typically try to avoid using ingredients that might be difficult for someone to find I have to make an exception here. The special ingredient that I use in this dressing that really makes this dressing is called Aromat by Knorr. It's an ingredient that is ubiquitous in the cupboards of Swiss kitchens and I've actually seen it here in some supermarkets. If your supermarket doesn't carry this though a specialty food store or European style market should definitely carry it. Aromat looks like fine yellow salt and is salty in flavor with a bouillon type essence as well. You can use this to season hard boiled eggs, dressings, poultry, fish, there's no limit! Also, I decided to add some home-made croutons to this salad. 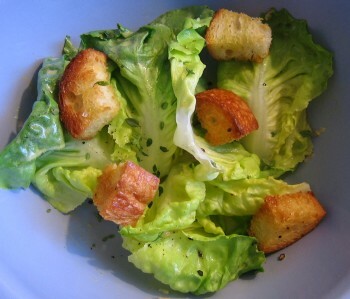 I remember croutons being quite popular in salads when I was younger but now I only see them in Caesar salads. I think it's time for them to make a come-back! Bibb lettuce (also called Boston or Butterhead lettuce) – you can use whatever lettuce you like here. Prepare by washing and removing the excess water using either a salad spinner or allow the rinsed salad to sit in a colander. 1) Cut the bread of your choice into about 3/4 inch cubes or so – you can remove the crust although I love to leave it on for a more rustic-style crouton. Place them on a baking sheet – drizzle with olive oil (only use enough to lightly coat the croutons) and sprinkle with salt and pepper. Toss with your hands so that everything is easily coated. Place in a 350F oven for about 12 minutes – check half way through and give them a little toss. You're looking for them to be a golden color – allow them to cool before adding to the salad or the heat of the croutons will wilt the lettuce. I know my grocery carries Knorr, I’ll look for Aromat. You are absolutely right, great dressings are good to have. I am always looking for a great dressing, thanks for sharing. I love trying different salad dressings and this one sounds great. I’ve never used Aromat before, even though I work at a Swiss bakery where we sell it pretty cheap. I’ll have to bring some home. I searched all over my local grocery store yesterday for Aromat with no luck. Is it typically in the spice section, or in the “prepared foods” section where they sell the flavoring packets? Thanks for your help, and I look forward to trying this dressing!